These LARP weapons are made to look like the real thing and will last for years of roleplaying. Our LARP Weapon are the best quality and safest weapons on the market today. We are proud to carry these LARP weapons and swords, bring what has been commonplace in European LARPing and re-enactment to the US. These LARP weapons are ideal for Live Action Role Playing, theatrical props, sword re-enactments and sword fighting. 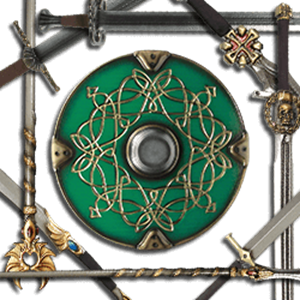 We are your leader in supplying your LARP Weapons and LARP swords. 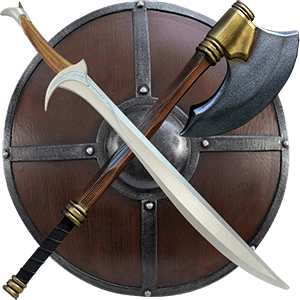 Our Selection of LARP Weapons include swords, daggers, axes, oriental weapons, maces, shields and Hammers. We are always added new LARP weapons and swords to our catalog so be sure to check back with us soon. We are sure you will find what you are looking for! Our LARP weapons are beautiful and will last on average 1-2 years of use without mistreatment. So consider building or buying a latex boffer weapon and having to repair or rebuilt it constantly over the costs of one of these weapons. Our LARP weapons and swords require a larger initial expenditure than building one yourself, but in the long run the beauty, realism, durability, and safety of our latex weapons makes owning one of these weapon a genuine pride and a joy. We also offer LARP leather armour to protect that LARP character from his opponent. We offer tons of LARP gear, from several different manufacturers. And if you are, yourself, a connoisseur of fine LARP gear and happen to gravitate towards a specific manufacturer, then we have divided up our LARP weapons by manufacturer to ensure that you can find exactly what you are looking for, in record time. And if you are just beginning, here is an equally good place to begin; you will find a number of different weapons under each category, enough so that you can establish a starting opinion of any of our various LARP weapon manufacturers. Of course, all of our LARP weapons are great for live action role plays; they also serve more than efficiently when used as theatrical props, mock sword battles, and practice weapons. Many of our LARP weapons are made of latex and feature solid cores to ensure a sturdy yet flexible weapon that is both perfect for swinging but cushioned to prevent severe injury upon impact. And many of our LARP weapons are also child-safe; they make for great toys as well as a great way to introduce your child into LARPing events. 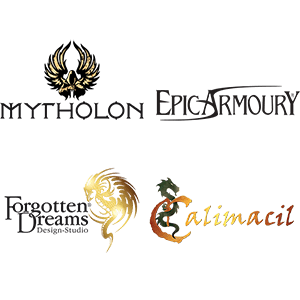 So if you have a preference to a specific LARP manufacturer, browse to your hearts content here. And if you are new, then welcome, and feel free to browse until your blue in the face.